The body, simultaneously most private of properties and most contested of spaces. The news of the miracle so close to the news of death. These aren’t complete sentences because sometimes a verb can deceive. An is or an are can reduce a constellation of meanings to a dry and misleading singularity. The antidote is metaphor, itself an incomplete and dangerous structure which carries, along with its capacity for expanding and attaching images, meanings, and ideas, a simultaneous machine that can be exploited, intentionally or not, toward ends the author might not endorse, or which the sentence itself was not made to bear. The history of the reading of poetry is full of problems of these sorts. No matter what is said, in a place such a poem read at the president’s inauguration, the context will douse the figurative and create new resonances, some the poet might have imagined, some no one might have imagined. Still, we who love poetry soldier on alongside those who make poetry. 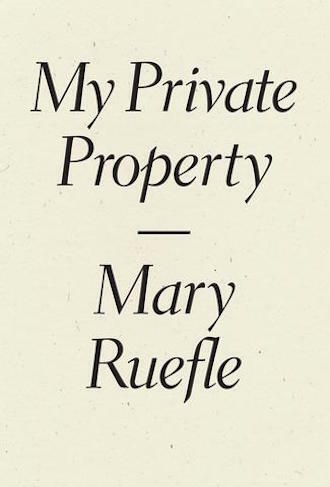 Mary Ruefle’s new book, a collection of prose poems, mostly, follows her two best books – the poetry collection Trances of the Blast (“The world was designed / to overwhelm and astonish. / Which makes it hard to like”) and the essay collection Madness, Rack, and Honey (“The words secret and sacred are siblings.”). How does a reviewer begin to try to summarize a book that begins in this mode and never lets up? And how does a reviewer begin to try to describe the experience of first reading a book like this in a moment in which it seemed like the world was beginning to stabilize, and then reading the book a second time, for ostensibly professional purposes, in a political moment in which a great sadness looms upon the land, one that aims its threat first at a multitude of legally vulnerable targets? One begins (probably wrongly) to believe that Mary Ruefle had anticipated this moment, and hid her propensity for prophecy behind a scrim of metaphor. In this book, passive resistance has become the “creed of keys,” taking the “form of what their tormentors call obstinacy.” In this book, “Blue sadness is sweetness cut into strips with scissors and then into little pieces by a knife, it is the sadness of reverie and nostalgia.” In this book, April, which has 58 days, after which it can’t go on, is represented by a photocopy of a “Cryalog” on lined composition book paper. The title piece itself begins in a lament that “no one today displays any interest in the art of shrunken heads” and ends first in implication (“How can I call myself benevolent? I want, as my personal private property, twelve human heads”) and second in terrible reflection (“It occurs to me I wanted to die that day. Why else would I have skipped school and wandered off alone and found a friend among the dead? One who thrilled me to life?”). Sadness and reckoning both demand the rejection of orthodoxy. I feel that I have inadequately described this book, which defies the reduction that book reviews require of their typist-failers—you have to read the whole thing to register an impression of the whole thing, and, more importantly, an impression of the many whole things that sit just beyond what’s in view of the fragment the book seems to want to be, a fragment made up of fragments torn from whole things or from things that never had any hope of being made whole.